Wick Golden Valley Nature Reserve contains a variety of habitats along the slopes and bottom of the valley, including a river corridor, woodland and grassland. These habitats have been heavily influenced by the quarrying and production of refined ochre that took place in the 20th century. “A paradise on our doorstep” – that’s how one local resident from Wick described the former ochre works site between Bristol and Bath. The site is now managed as a local nature reserve after the local community worked in partnership with the council and the landowners, Cemex, to formally declare the site in 2005. Since then work has been carried out to ensure the site is well managed – both for people and wildlife. Since 2008 we have received the prestigious Green Flag award in recognition of our achievements on site and in the community. The River Boyd runs through the site. A long stretch of the river corridor contained within the boundaries of the site has been straightened. There are some large old trees, including species that indicate ancient woodland. Other areas of woodland are dominated by sycamore. There are pockets of grassland, with one large area at the highest point (known as Raven’s Rock). At the bottom of the valley are the remains of buildings used to manufacture ochre. Scrub has developed to form a mosaic of grassland and trees such as birch and willow. The lower part of the reserve is fully accessible for wheelchair users and pushchairs. Parking is available at the nearby Carpenters Arms, where two parking bays have been reserved. The 250m walk from the pub along tarmac paths and up a private lane takes you to the main entrance to the reserve. From here take the tarmac road up to the bridge and follow the red ochre trail, a circular walk about a mile long. A heritage walks leaflet which contains two walks through the reserve is available to download from this webpage. Wildtracks will lead you through the Golden Valley at Wick and into the wider countryside within the Forest of Avon. The circular walks have been devised by local people living in the area who walk these routes on a regular basis. The routes have been marked out on maps that you can download. You can also get information on the walks from local pubs. The site has a long history of heavy industrial workings on the site. There was a iron-founding industry at Wick from the mid-eighteenth century based on the water power provided by the River Boyd. In 1761 it was reported that there was an iron works and paper mill within the valley. The 1882 Ordnance Survey map shows a rolling mill and dam across the river and soon after records show that the internationally renowned ochre processing works were in operation in 1895. The works remained on the site up until 1968 when it was closed down. Two years later the buildings were demolished and the site was cleared and left for nature to reclaim. Eight goats have been helping to preserve rare habitat at Raven’s Rock in a pilot project which launched in January 2017. 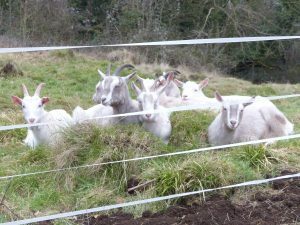 The goats are being looked after by local schoolchildren and a group of volunteer herders in conjunction with our Community Spaces team and urban community farming project Street Goat. They will remain on site for two months to help manage the grassland and reduce encroaching brambles. We hope the grazing will also lead to a return of rare plants on the grassland and bluebells in the woodland. The project has been funded by national charity Bug Life, who will be assisting us with monitoring the success of the project this summer. The reserve is cared for by local people through the Friends of Wick Golden Valley to assist the council in managing the reserve. The group organises a range of events and practical workdays to help raise awareness of the nature reserve and to enhance its biodiversity. An audio guide relating to Wick Golden Valley, its history and the bats you’ll likely find there is available from local libraries. The guide is one of three specially created to assist people – including those who are visually impaired, to visit the site at dusk and discover the magic of bat detecting. Further information is available from the Bat audio trail page. By foot: There are a number of public rights of way that link up to the reserve. By bicycle: The reserve is accessible by bicycle from the A420 with two cycle ‘rock locks’ near the entrance of the site. Bus: Bus services are available along the A420 with stops close to the reserve entrance, near the Carpenters Arms. Car: Permission has been given to use the Wick Village Hall car park, which is signposted off the A420 near the Rose and Crown pub. Blue badge holders can use two accessible parking bays at the Carpenters Arms.